Other Products by International Protein. 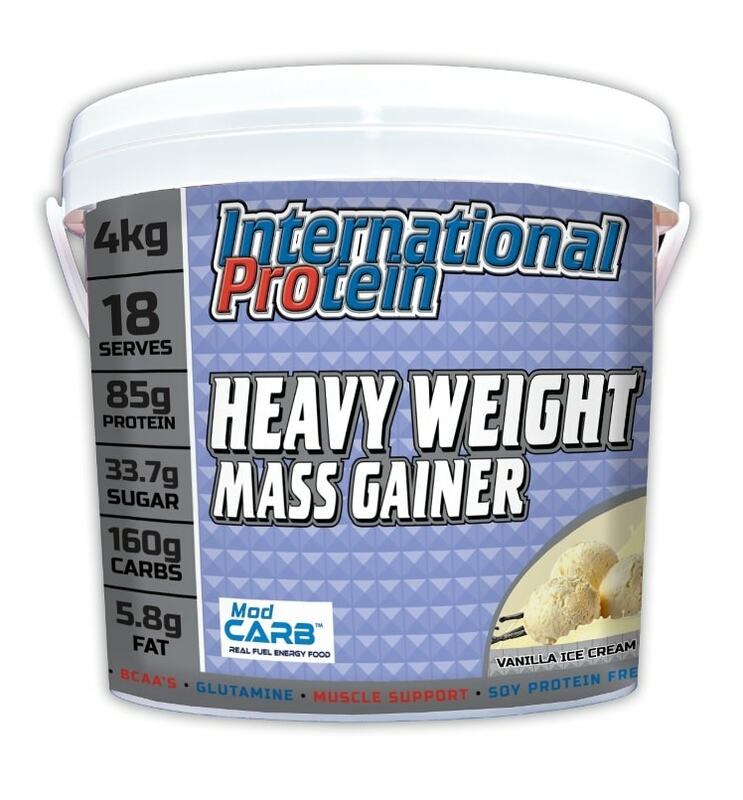 Search other Mass Gainer Protein products. There are few brands in Australia that have the committment to quality and ethical manufacturing practices than International Protein do, located at Ormeau on the Gold Coast. This brand is synonymous with trust. The all new Heavyweight Mass Gainer delivers a different spin on their hugely popular Extreme Mass Gainer that has been rocking the shelves of health food stores and gym for decades now. The Heavyweight MassGainer is more tailored to people who have very high energy output and naturally fast metabolisms. This product offers more carbohydrate than protein, though still delivers a whopping 29 grams of quality dairy protein per serve. In addition, a broad-spectrum digestive enzyme mix ensures that all of the macronutrient components are broken down properly for absorption. After all, weight gain is not just about what you eat, it's also about what the digestive system can handle. If gut function is poor, weight gain can be extremely hard to achieve. The digestive enzyme complex in Heavyweight Mass helps to overcome this. Carbohydrates are helpful nutrients that serve some vital roles during mass gains programs. Firstly, they create an insulin spike. Insulin is perhaps the most anabolic hormone that we produce. Why? Because it not only drives glucose or sugar into muscle cells, but amino acids as well. And these are the amino acids that we need for protein synthesis, or muscle repair and growth. Secondly, carbs keep our body replete in glycogen. We rely on glycogen, in part, for the energy needed during weigt training, particularly higher repitition sets. This ensures we can power through sets and knock down reps quick smart. This is another superb product from International Protein. Heavyweight Mass will have you wondering how you could ever have trainwed without it! So get ready to stretch out some shirts accross the chest. Gains await! Mix 6 Scoops (220g) into 400-500ml Skim Milk. Ideally, taken immediately after exercise, and additional serves away from major meal times, such as morning tea, afternoon tea and before bed. Alternatively, for anyone not wanting to gain weight, a half serve (3 Scoops) can be mixed in water and taken after intensive bouts of exercise (once daily) to speed up glycogen restoration and protein synthesis. INGREDIENTS: CARB COMPLEX [Maltodextrin, ModCarbTM Gluten Free (Trim® Processed: Oat Bran, Quinoa, Amaranth, Buckwheat, Millet), Trehalose], PROTEIN SYSTEM (Whey Protein Concentrate, Calcium Caseinate, Whey Protein Isolate, Hydrolysed Whey Protein Isolate), Cocoa*, Flavours, L-Glutamine, L-Leucine, L-Isoleucine, L-Valine, Emulsifier (Soy Lecithin), OMEGA-RICH BLEND (Medium Chain Triglycerides, Omega Powder), DigeZyme®, Taurine, Sweeteners (Sucralose), Vitamins and Minerals [Sodium Ascorbate (Vitamin C), Ferrous Fumarate (Iron), Zinc Sulphate (Zinc), Niacin, Vitamin E, Riboflavin (Vitamin B2), Pyridoxine HCl (Vitamin B6), Thiamine (Vitamin B1), Vitamin A, Folic Acid (Folate), Cholecalciferol (Vitamin D3), Cyanocobalamin (Vitamin B12)].